Bad news for compulsive plate-clearers: The average size of many of our meals — whether from fast-food chains, sit-down restaurants or even the grocery store — has increased by as much as 138 percent since the 1970s, according to data from the American Journal of Public Health, the Journal of Nutrition and the Journal of the American Medical Association. 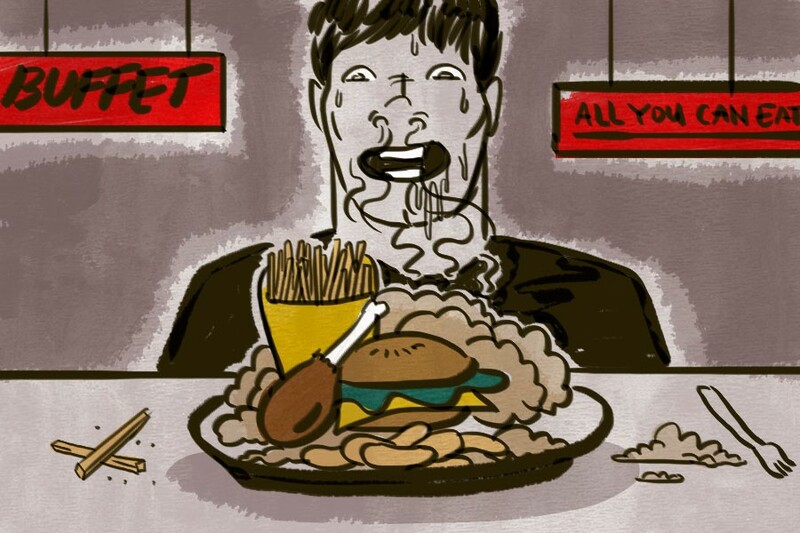 You’re Afraid of Being Wasteful: “Whenever we sit down to eat, we’re unconsciously thinking, ‘If I don’t finish this, it’s money down the drain,’ or ‘I’m going to be hungry in half an hour,’” psychologist Aida Vazin explains. You Need to See an Empty Plate to Feel Full: “We’re programmed to finish what we started, and the feeling of fullness is often tied to the visual absence of food on the plate,” says board-certified weight loss expert Matthew Pinto. That is, we assume we have to finish everything in front of us in order to be satiated. You May Not Be Getting Enough Vitamins and Minerals: Most of the food that’s pushed on us these days — specifically junk food — is lacking in the nutrients our bodies need to feel satiated. “If our body is missing certain vitamins and minerals, it can trigger the urge to overeat in search of those nutrients,” explains natural health and holistic nutrition coach Brandy Gillmore. So basically, we’re clearing our plate simply because our bodies are hoping there may be some real food on it somewhere. Drink Some Water: “Sometimes our bodies confuse thirst for hunger,” Gillmore says, so try downing a glass of water before grabbing that third handful of peanuts. It could be the difference between finishing the entire carton of nuts and having just a few. While eating healthier and drinking water probably weren’t the tips you were looking for (are they ever? ), they’re the tips that work — at least, according to the experts. So if you want to quit plowing through snacks and pizza like a wild animal, get used to eating your vegetables.